Every year during the New Orleans Writing Marathon I make a point of crossing the Mississippi River on the Algiers Ferry. 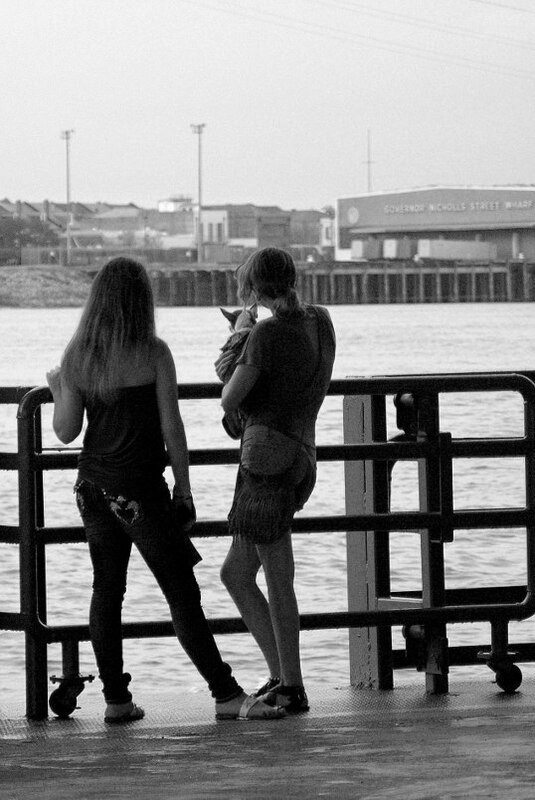 This year a group of poets decided to walk through the French Quarter and make the crossing. I’m no poet, but the rules aren’t too strict, so I tagged along. I love riding the Ferry, though I have done it more than a few times. 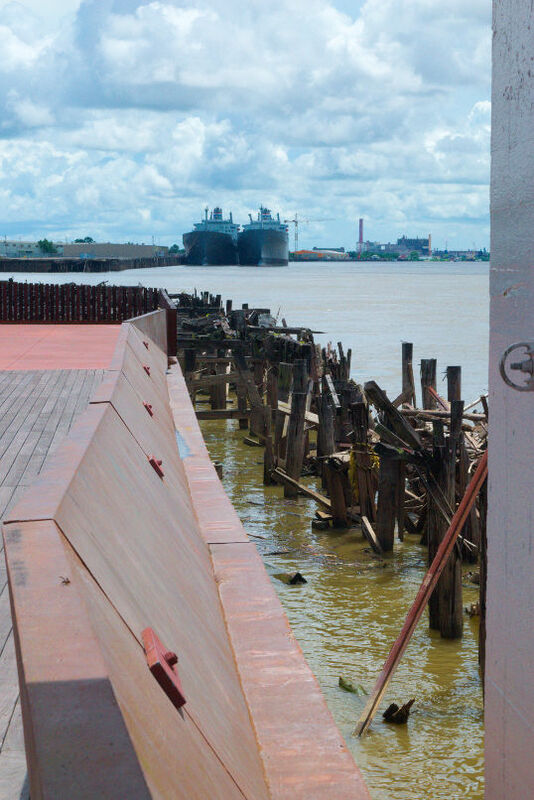 The Algiers Ferry moves cars, pedestrians, and cyclists from the dock at the foot of Canal Street across to the town of Algiers on the West Bank. Even though you are going from the Eastern half United States to the West, due to the twisting river the boat actually goes sort of in another direction. There is something about crossing the Mississippi, though I always think of the ferry as the spot where John Goodman’s character committed suicide in the series Treme. If you’ve ever seen the film Déjà Vu this is the ferry the terrorists attack. The day was incredibly hot and humid and we maneuvered our route to the ferry to use as much shade as possible. The trip across is two dollars, cash only, no change – I always take a stack of ones and quarters with me when I go to New Orleans for the ferry and the streetcar. Two women and a dog In the middle of the river on the Algiers Ferry. On the Algiers side we went to a trio of spots to write. First was breakfast at Tout de Suite Cafe, which was very good. Right next door was the excellent cafe/coffee shop Two Birds, One Stone – they had a back room full of pinball machines and big tables, a perfect place to write. The young owners were very accommodating to our group – I want to visit again and recommend you do too. I wrote snippets of text at both, then we walked on to Congregation Coffee Roasters for a third stop. I decided to churn out a poem, since that was what everybody else was doing. It was still fairly early, but some of the others had to get back to do a radio broadcast – everybody piled back on the ferry for the trip back.I was distracted by two bike share rental bikes at the ferry terminal and, checking the map on my phone, discovered there was a bike trail on the top of the river levee on the Algiers side – so I opened the app on my phone and unlocked a bike – deciding to go for a ride. 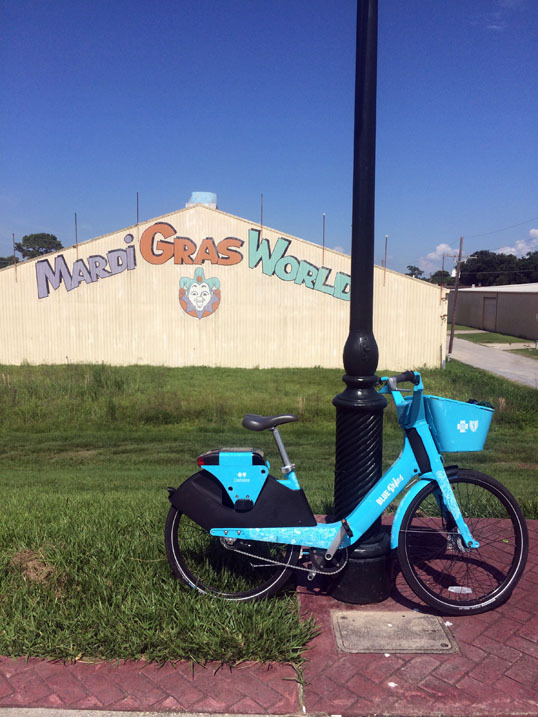 The New Orleans bike share bikes are built like a tank, and as heavy as one – but the city is flat so that doesn’t cause too much of a problem. It took me a minute to find the control and downshift so I could climb onto the Levee and the swept handlebars took some getting used to. But soon enough I had it all in control and was moving down the smooth levee trail. I rode south (or more exactly, downriver – the Mississippi curves) for a few miles, down past the Naval station. It was fun – the view of the river and giant ships and barges on one side – the picturesque streets of Algiers on the other. The path sort of petered out and I rode back, past the ferry station and upriver to the giant double bridge… the Crescent City Connector. That was about seven miles and about all I felt up to, so I rode back to the ferry and parked my rented bike. It was a lot of fun, but there was one problem. It was so hot. It was like riding through a blast furnace. There was no breeze at all – no cooling relief coming off of the river. The top of the Levee is very exposed, not a bit of shade. The burning sun, the boiling air, and the famous New Orleans summer humidity made for a sweaty, exhausting ride. 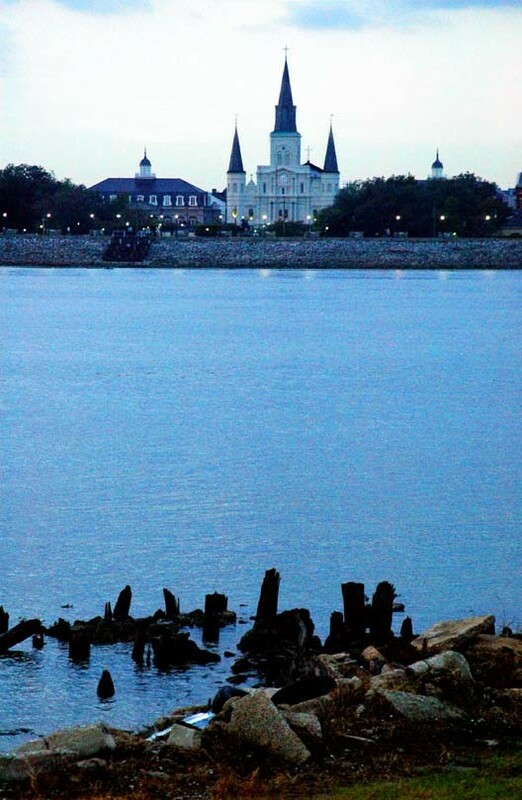 I was so worn out that when I made it back across the river I was lazy and took a streetcar through the French Quarter (still had a dollar bill and a quarter) back to where we were meeting. A long day, a hot day, but a nice time. Can’t wait to go back. New family member, Isaak. He does not like going on walks - yet. Working on it. The past is over and gone.